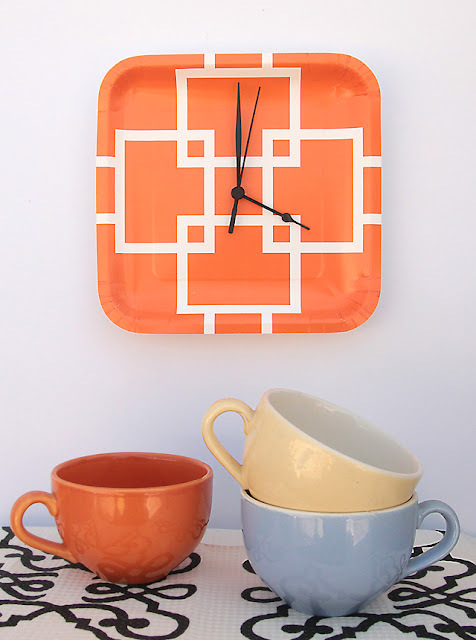 I love clocks and I absolutely adore this fun paper plate clock from Creative Jewish Mom, but you would never know I love clocks by looking at my house. There is not a single clock hanging in my house. There is a clock on the cable box and one on the microwave, one on the intercom that is always an hour off during daylight savings time because I have never even tried to figure out how to change the time. It is my silent rebellion against daylight savings time. There is actually a traditional clock sitting on the counter in our master bathroom, but it isn't technically hanging. I even have a lot of DIY clock tutorials on my blog, all of which I really love, but I still have never bought or made a clock for our home. The one in the master bathroom was a wedding gift. So would it be crazy if the only clock I have hanging in my house was made out of a paper plate? It would be in the kitchen dining area, so at least the paper plate theme would be appropriate. But I love the idea that I could change out the paper plate all of the time in just a matter of minutes. and just think of the color options, not to mention how easy it would be to switch out for holidays. Don't you kind of want one too? You can check out this fun five minute clock tutorial HERE.